And I thought I had a quiet winter ahead of me! Last year I agreed to be part of the July 2010 exhibition at the Taupo Museum. Who would have expected that the Ashburton Society of Arts wanted to have me as guest artist for their 46th Annual Exhibition, then the Waiheke Community Art Gallery asked me to take part in their exhibition “Winterʼs Jewels” and just as I recovered from the jetlag after my overseas trip some of my jewellery pieces were requested for the upcoming show atthe Hastings Art Gallery. All jewellery to be sent off in July! No complaints though, donʼt get me wrong! It is an honor to be involved in shows! But to prepare for four exhibitions is very exhausting and doesnʼt leave much time foranything else! 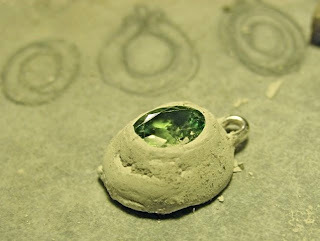 The following photos show some steps in finishing a small pendant in precious metal clay I work with. 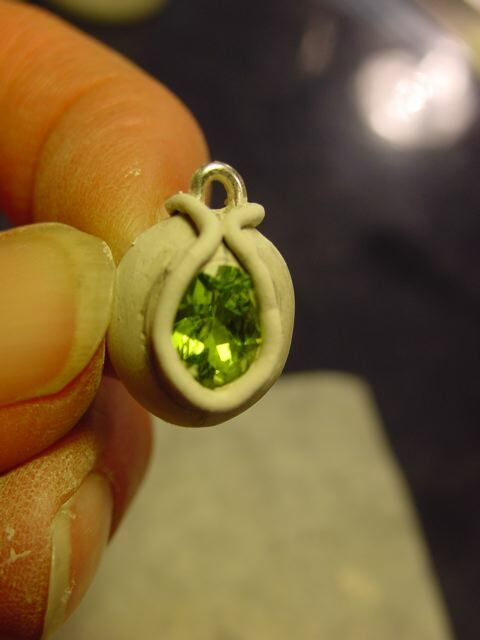 The first is the clay roughly covering a little paper clay model where I sat the faceted natural peridot in, with the loop added at the top where the pendant hangs from. In the background you can see a few drawings I made before I started with this piece. 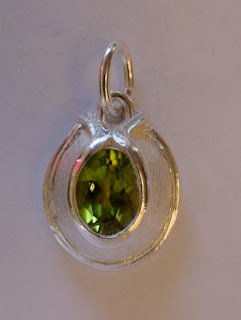 Though I must say my one-off jewellery items mostly evolve without much planning. Then a line was added around the stone. At this stage there are still some rough patches, which are filled with silver paste. These need to dry before they can be sanded smooth. The finished piece shows you a second line around the bottom of the piece. After the pendant was fired it got a treatment with a stainless steel brush and then a toolcalled “burnisher” which brings the highlights on the raised parts. The pendant looks really sweet on a fine chain. It can be seen (and purchased) in the exhibition “Art Created Here” at the Hastings Art Gallery beside the library. The opening will be on 7 August from 4.30pm! See you there for a glass of wine! Other galleries stocking my jewellery are Statements Gallery in Napier, Unio Goldsmith and Gallery in Havelock North, Sarjeant Gallery in Wanganui, Zea You Gallery in Taupo, the retail store of Te Papa Museum in Wellington, Form Gallery in Christchurch. can be found on www.arcadiastudio.co.nz. I never cease to be amazed at your gorgeous work and the processes involved Ingrid :). Can't wait to catch up and hear about your overseas adventures too! I love your work, you have so much skill and talent. I can really sympathize with meeting the demand since my husband is a glass blower and we just recieved an order for 600 pieces! It's a blessing and an exhaustion at the same time. Best of luck to you in your exhibits though. I'm sure you will be a huge success! Really interesting to see how you make your beautiful pieces... and good luck the all the exhibitions and show you are involved in this month.